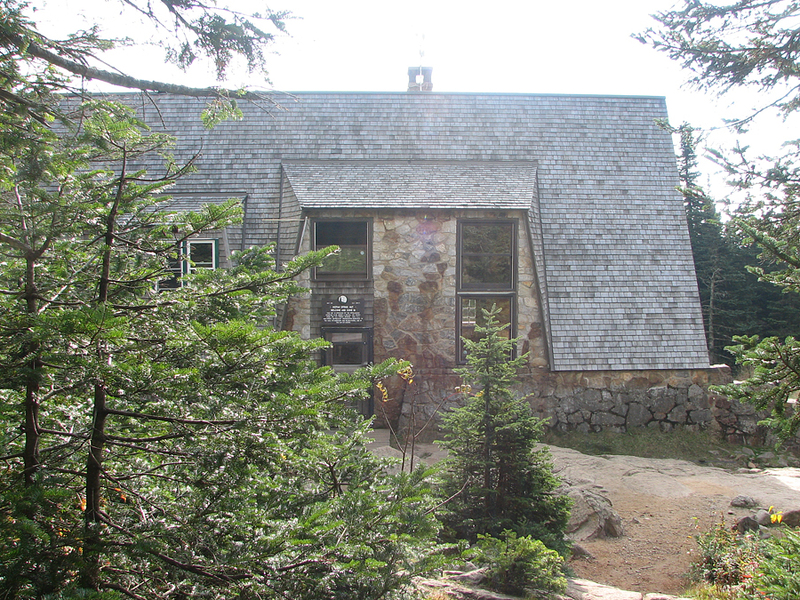 For this trip, I wanted to climb some of the Presidentials, at least Mts Pierce and Eisenhower, and possibly Monroe, but I also needed to pick up my trail maintenance tools from Mizpah Spring Hut as they were going to close the hut for the season in a few days. I don't like to leave my tools there over the winter, and I sometimes use them around the house in the fall. In fact, they were to prove particularly useful later that month when an early snowstorm dropped nearly a foot of wet snow, breaking many large branches and toppling trees that still had most of their leaves on them. We also lost power for four days. 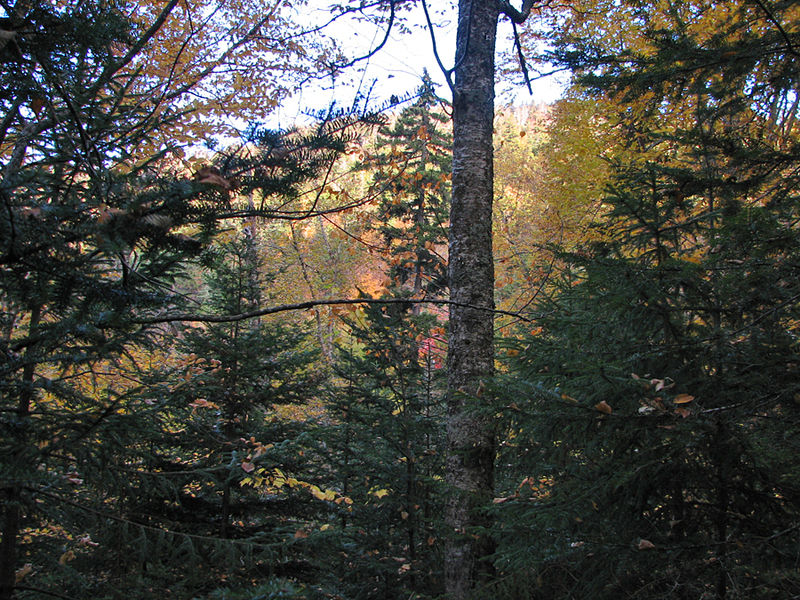 It was a nice fall day and the lowland colors were pretty much at, or perhaps just a little past peak. The temperature was nice too, not cold but not too warm, although it was windy up above treeline. Mt Washington was experiencing 70-80 mph winds. After stopping at the hut and retrieving my tools, I refilled my water bottles and headed up the steep rocky Webster Cliff Trail, which rises abruptly from Mizpah Hut to the ridgeline. On the way up, I stopped a couple of times to take pictures of the rockwork, ladders, and timber puncheons, and of course, to catch my breath. On top of Mt Pierce, the wind rattled the fabric of my jacket as I zipped it up tightly. 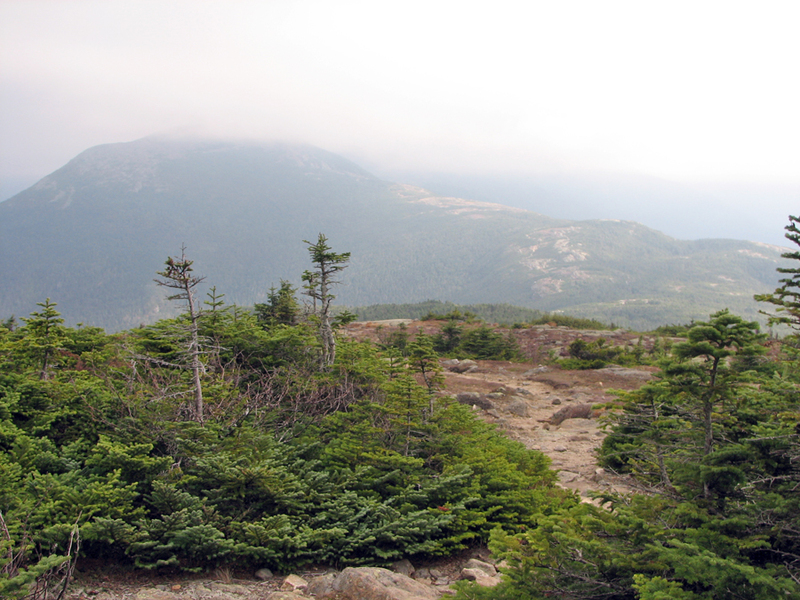 Clouds were blowing across the higher peaks, and Mt Washington itself was completely enshrouded. 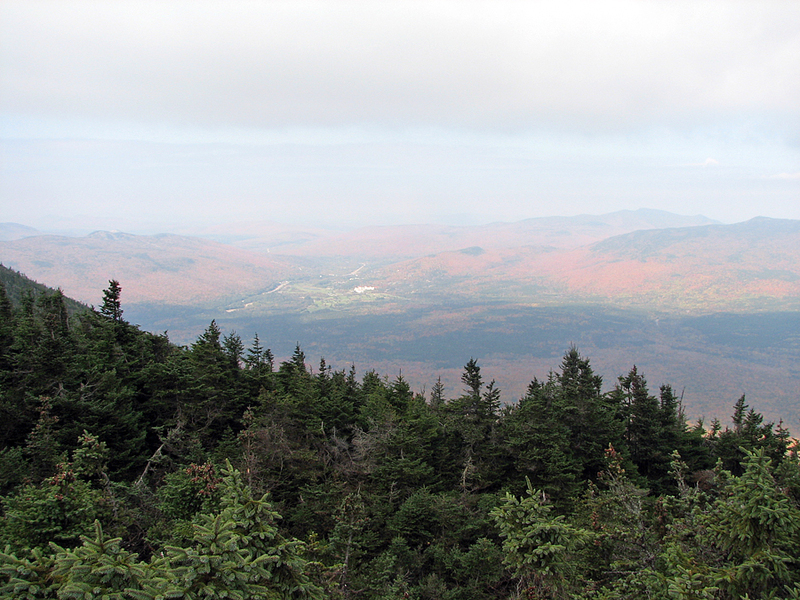 As I made my way up the Crawford Path toward Mt Eisenhower along the ridgeline, I got some nice photos of the fall colors down below, even though the views were a bit hazy. 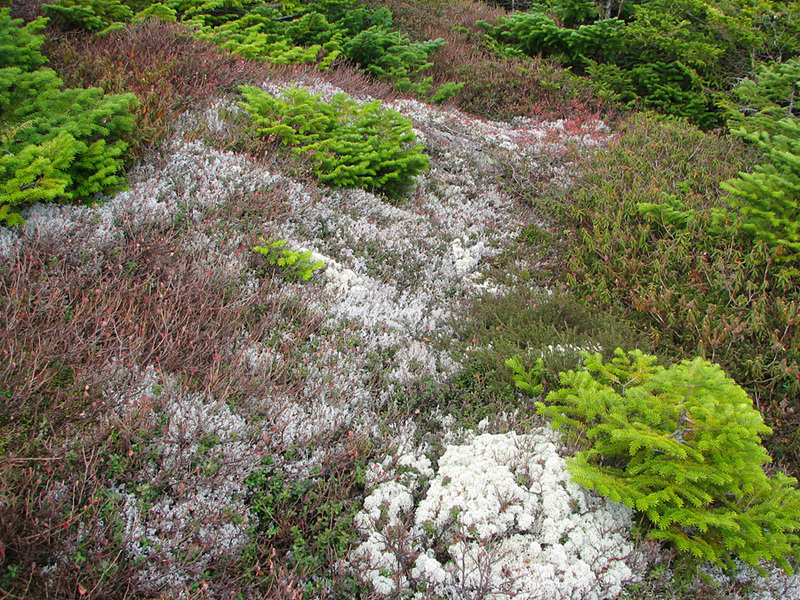 Autumn color had also come to the alpine zone, but were more subdued than at the lower elevations. The shores of tiny Red Pond at the foot of Mt Eisenhower were blanketed in shades of brown and gold. 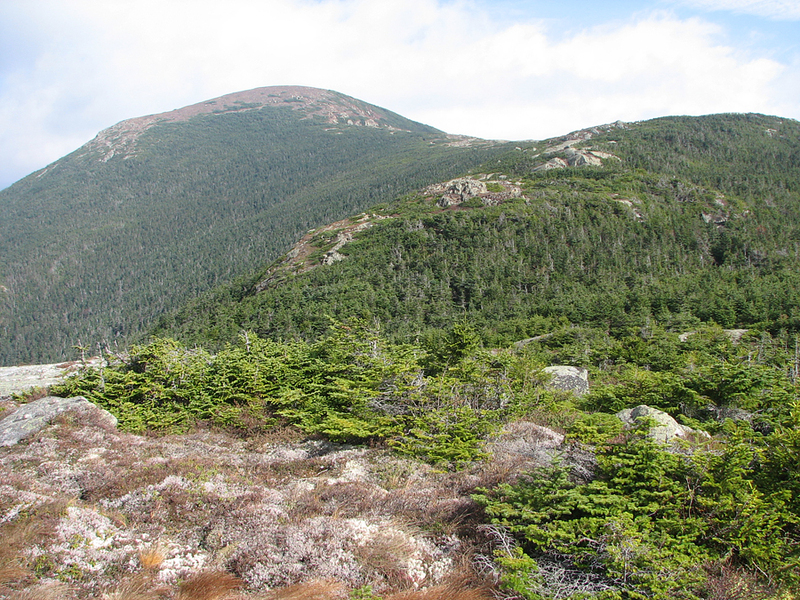 I had thought the wind to be strong atop Mt Pierce, and had experienced some serious gusts in exposed areas of the ridgeline, but the col between Mts Eisenhower and Franklin, fueled by the ravine cut by Mt Pleasant Brook, was a veritable wind tunnel. 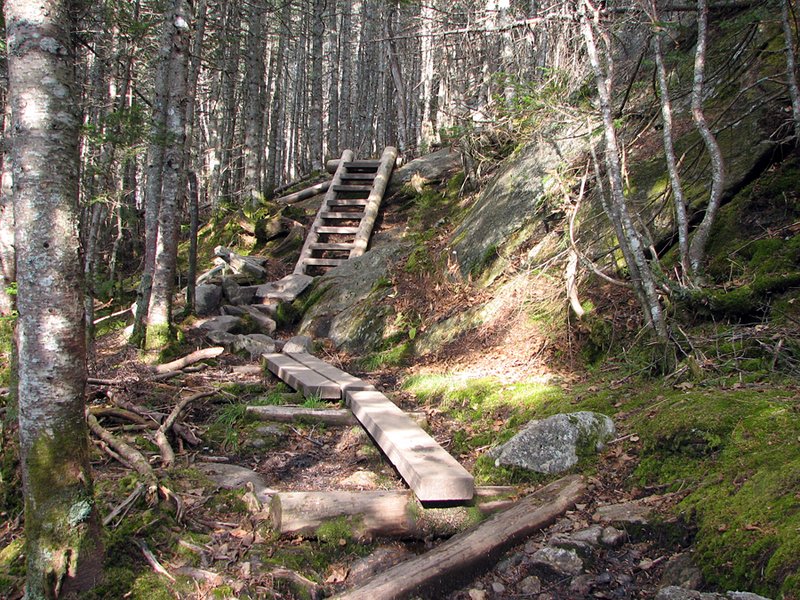 After removing my pack and leaving it in the scrub by Red Pond, I started to climb the Mt Eisenhower Loop. At first, there were numerous sheltered areas as the trail wound upward through the scrub and large rock outcrops, but after the trail straightened out, the full force of the blast was upon me. During the fiercest gusts, I was barely able to stand, and crouched or kneeled against the scree walls for stability. The wind battered the hood of my jacket so fiercely, flapping and vibrating it against my ears, that the roar nearly obliterated the feeble sounds that came out of my mouth in defiance. At the top, I quickly dashed for the lee of the large summit cairn, which at least provided a modicum of protection from the blasts. Sitting down and leaning against the cairn, I was able to take some nice shots of the ridge to the north, although Washington itself was still encased in clouds. Needless to say, I did not stay up there very long, but soon began making my way down again, leaning heavily against my poles to keep from being blown off the trail or pitching forward onto my face, again crouching when necessary. I breathed a sigh of relief when I finally reached the shelter of the scrub, but it wasn't until I had donned my pack and descended back below treeline that I was able to remove my hood and relax my step. I had hoped to find a ride from the Edmunds Path trailhead back to the Highland Center, but there were only a couple of cars grinding their way down the graveled Mt Clinton Road, neither of which appeared to belong to other hikers. I didn't even bother trying to hitchhike, remembering my futile attempts to get a ride from the Dry River Trailhead to the Highland Center back in 2001, even while carrying a dog with an injured paw. 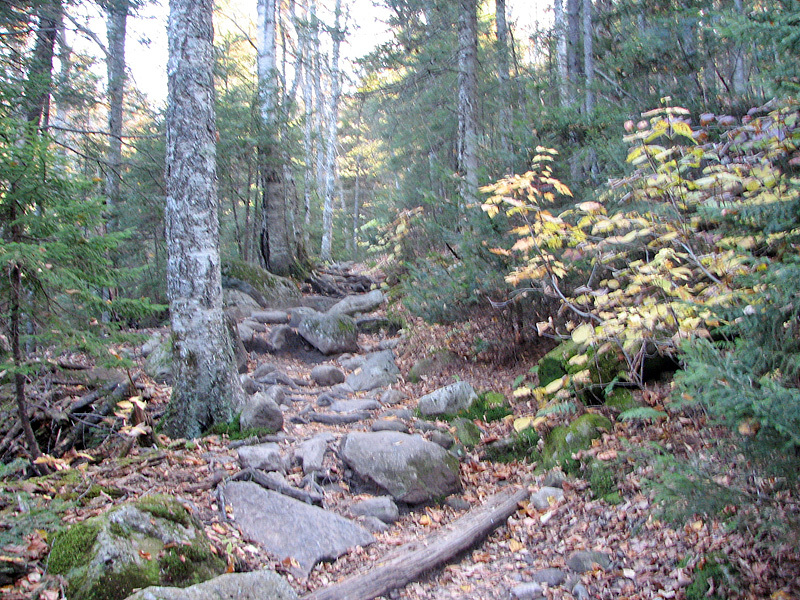 Fall color along Gibbs Brook along the lower portion of the Crawford Path..
Crawford Path near the Gibbs Falls Spur. Mizpah Spring Hut. I stopped there to pick up my tools in the hut's basement, since the hut was about to close for the season. 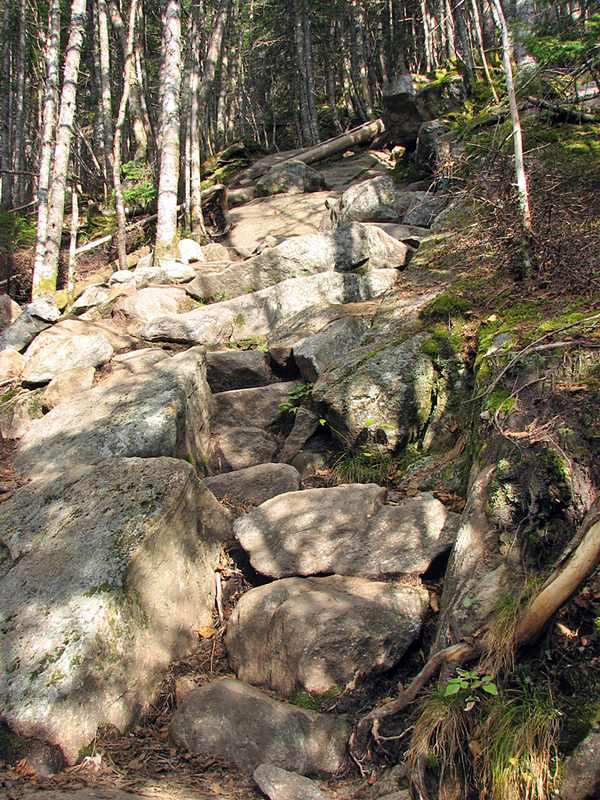 Steep rocky portion of the Webster Cliff Trail, which rises abruptly from Mizpah Hut to the ridgeline. Webster Cliff Trail puncheons and ladder. Foggy Mt Eisenhower from the summit of Mt Pierce. Red and orange fall color along Rt 302. 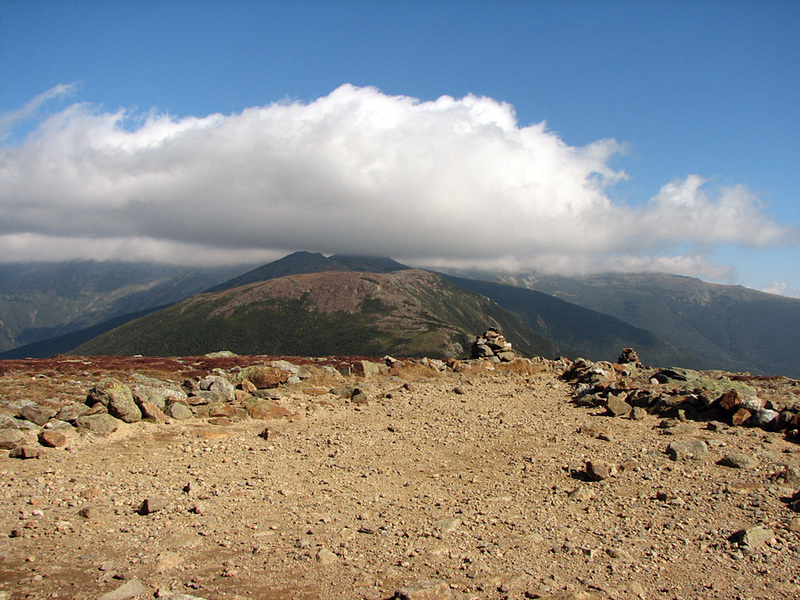 The Mt Washington Hotel is visible near the center of the picture. Alpine plants along the Crawford Path. Autumn color changes in the alpine zone are more subdued than at lower elevations, but are still noticeable. 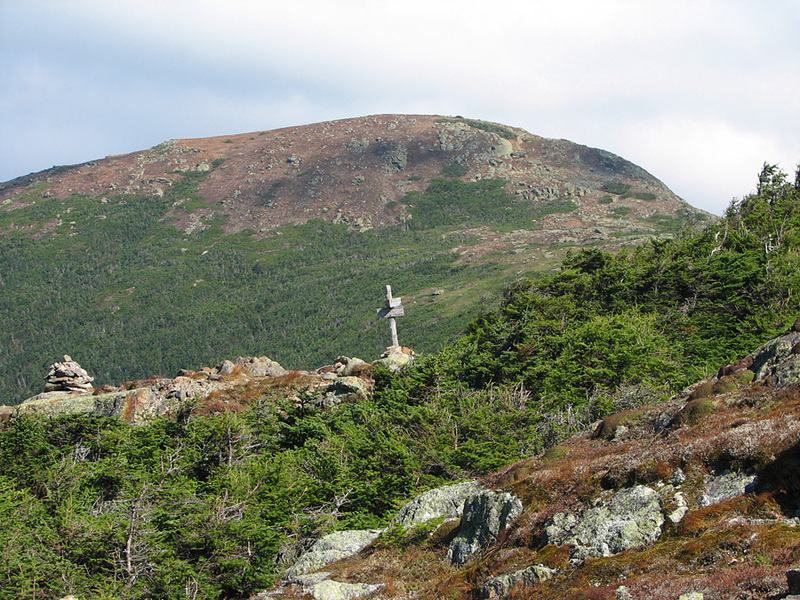 The Crawford Path winds it way up the ridge toward Mt Eisenhower. Red pond. 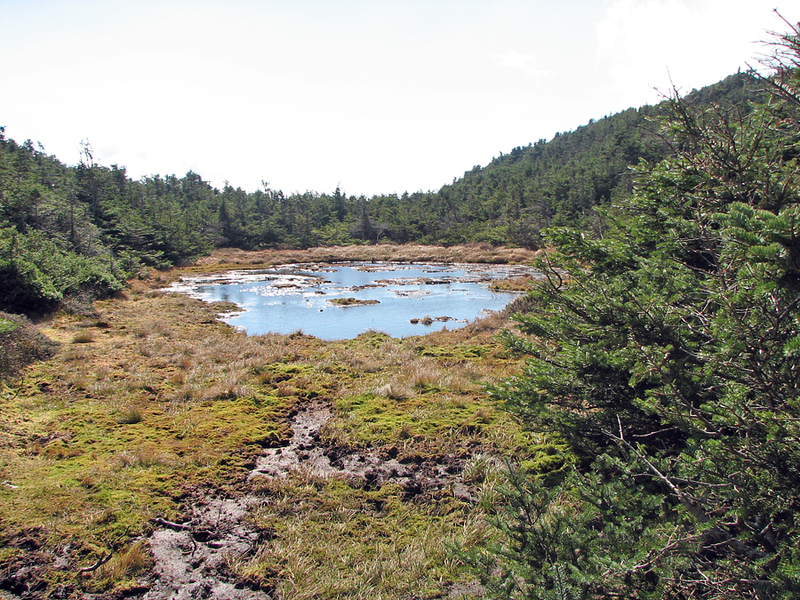 This tiny boggy pond at the base of Mt Eisenhower seems to be growing smaller every year. Mts Franklin and Monroe from the windy northern slopes of Mt Eisenhower. Self-portrait on Mt Eisenhower. The wind was too strong to really stand. I found some small relief in the lee of the large summit cairn. 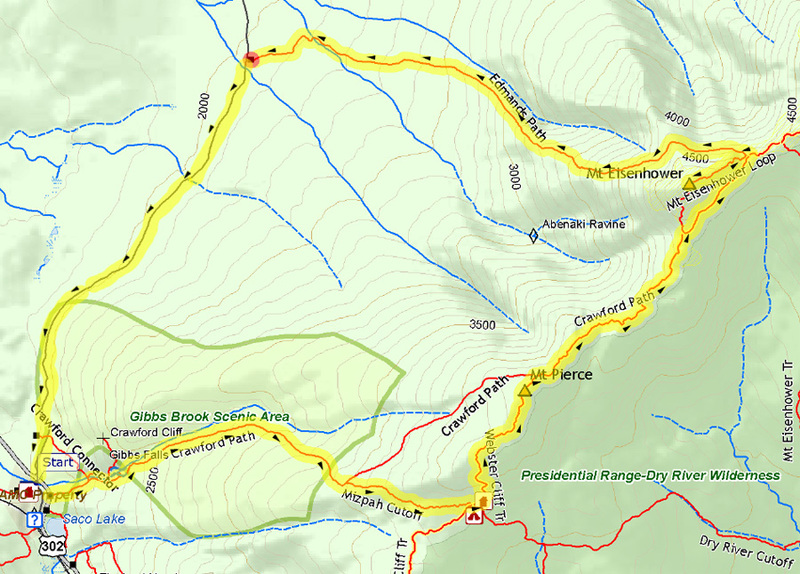 Mt Franklin and the Crawford Path - Edmunds Path junction from Red Pond.